If your blog is popular and there are hundreds of entrecard fans following to drop cards, then you don't have to worry and make an effort to drop 300 entrecard drops daily. BUT, if you need a quality visitors, then you would visit the entrecard members blog and drop your cards. This is the first step you've to do when you sign up at Entrecard or probably for ever until you get some recognition. You know the way you are dropping your cards, it's pretty time consuming. I must emphasize again, it's really really time consuming. What do you do normally? -Go to the Entrecard dashboard and find out whoever dropped their cards on yours. Then most probably you'd right click on their 125 x 125 entrecard and select 'Open in new Tab' or so. - If you think yourself extra smart or cool, you would hold the CTRL+SHIFT(or just SHIFT) key and left click all those links one by one. - You would go to 'campaign' after finishing the visits to those recent droppers and now painfully slow process of dropping cards begins. There are hundreds of blogs under different categories and it would take forever to drop your cards on them. Last time, I had a small discussion with my friend and he told me that it usually takes 4 hours to drop 300 Entrecards per day. 4 hoursssssss??? I barely spent 30 minutes to drop because I knew how painfully slow process it is to drop cards. 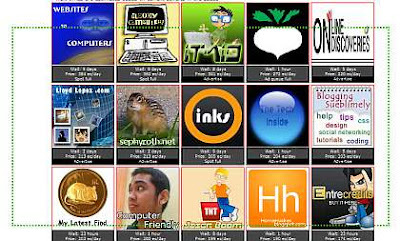 -drag around all the links of 125 x 125 entrecards and release the right-mouse button. -At one go, all links shall open. So, visit individual page and start dropping. In an average, you'll be saving 10 seconds of your precious time per drop. One more thing, it will be too taxing for your browser and your system if you are on dialup and has slow system, so start with 5 or upto 10 links altogether but if you are on broadband, use this firefox hack to speed up things to prevent yourself from browser lockups or crashes. - In firefox address bar, type 'about:config' (without quotes) and hit enter key. "network.http.pipelining.maxrequests" to some number like 25. This means it will make 25 requests at once. Finally, right-click anywhere and select New-> Integer. Now broadband users will be able to fully exploit their speedy bandwidth. it makes addicted, so i only give half an hour time to drop card, who drops on my. but its really good, to expose your blog to rest of the world. And get some traffic on blog.